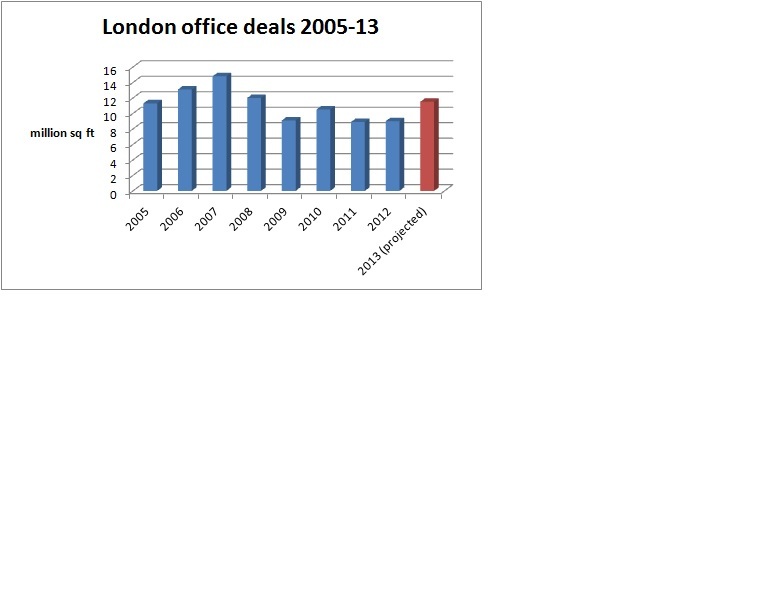 Four office schemes schemes were completed in the City of London in in Q3 2013, totalling 334,000 sq ft. The developments included the 203,000 sq ft at Sixty London, EC1, already entirely pre-let to Amazon, as well as the refurbishment at 7 Bishopsgate, EC2 (56,000 sq ft), 36 Queen Street, EC4 and Monument Place, EC3 (75,000 sq ft) which are all available for letting. Hot on the heels of the news that London office take-up reached 9m sq ft in the first nine months of 2013 (more than the whole of 2012), comes the statistic that four out of the five biggest deals took place in the fringe areas. Large London deals this year involving Debenhams, Google, Ogilvy & Mather and KPMG illustrated that firms prefer to look for value for money despite a rising tide of office completions in the core London markets. Metropolis is forecasting a final London take-up figure for 2013 of around 11.5m sq ft based on a slightly reduced list of firms under offer on space in central London that are likely to complete deals by the end of the year. PRS for Music, the music licensing organisation, has signed to pre-let 4,831 sq m (52,000 sq ft) of offices on the top four floors, at the under construction Two Pancras Square, King’s Cross Central, London, N1. The building will be completed in summer 2014. PRS, which is taking a 15 year lease to 2029. 9 million reasons to be optimistic..
London office take-up in September saw 812,000 sq ft of lettings, bringing the total for Q3 2013 to 3.1m sq ft. There were fewer large deals in September with no transactions over 100,000 sq ft, however this was compensated for by the number of deals over 5,000 sq ft, which reached 58 – one of the largest monthly totals of the year. The year to date lettings of nearly 9m sq ft is 20% ahead of 2012’s total at the same point. 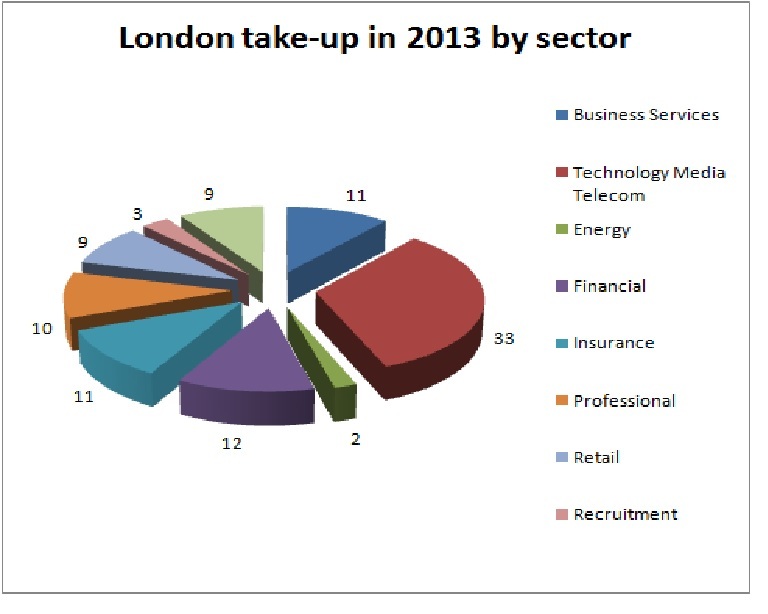 The TMT sectors continue to take-up the slack, produced by the sluggish performance of the financial and professional sectors, with occupiers such as Microsoft, Facebook and Twitter concluding deals for London office space in September 2013. Looking ahead, some 30% of the 500 currently active London office requirements being monitored by Metropolis come from the technology, media and telecom sectors. A report this week by Edinburgh property consultant CKD Galbraith indicated that Q3 2013 office take-up in Edinburgh had reached 270,000 sq ft; which is up sharply on previous quarters. The relocations announced were dominated by five big lettings: 85,000 sq ft at 3 Lochside Avenue to Sainsbury’s Bank; 33,000 sq ft to Jardine Lloyd Thompson at 7 Lochside Avenue; 55,000 sq ft at Capital House to Bank of New York Mellon; 32,000 sq ft at Atria One to PwC and Skyscanner taking a further 10,000 sq ft at Quartermile One. These five deals accounted for 80% of space transacted. Research by Metropolis suggests there are still some 40 firms searching for space in Edinburgh, however most are looking for below 20,000 sq ft. A number of deals are currently ‘under offer’. An October 2013 Cardiff office market report by property consultant GVA concludes that there is a shortage of readily available grade A office stock in the city, following the completion of Admiral’s new 200,000 sq ft HQ. The ‘Tipping Point’ report lists six medium to large requirements in the city, from the likes of AA, Geldards, L&G, Cunningham Lindsay and HSBC which total nearly 180,000 sq ft.
An analysis by Metropolis points to an even greater level of demand for office space in Cardiff. We are currently monitoring over 20 medium/large locally-based firms, either in Cardiff or looking at the city, which either have confirmed searches underway or are approaching lease decisions in 2014. The main office schemes in the pipeline are the 75,000 sq ft Capital Quarter; 2 Callaghan Square where there is consent for up to 500,000 sq ft and Capital Quarter where developer Rightacres is contemplating a start on a 140,000 sq ft scheme. Further details at our Cityoffices.net site. None of these schemes are currently under construction, so many of the requirements will have to wait or settle for refurbishing B grade space in Cardiff. Some interesting plot twists await.